Hagia Sophia is not only a striking architectural landmark but a time capsule of Istanbul, reflecting the many civilizations that have impacted the city over the centuries. We’ve just returned from a trip to Istanbul with Turkish Airlines and we couldn’t resist sharing our favourite site in the city, Hagia Sophia (also known as Aya Sofya). It’s recognized as one of the finest examples of Byzantine architecture on the planet; but beyond the beauty of its design, Hagia Sophia is also a fascinating physical reminder of the different civilizations that have controlled Istanbul over the centuries. 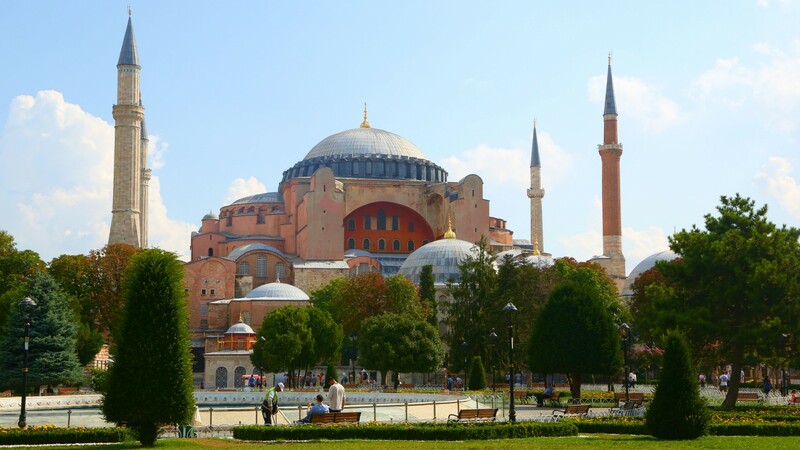 Hagia Sophia was originally built as a church by Byzantine emperor Justinian in 537. For centuries, it was one of the world’s largest and most significant religious sites. The Ottomans transformed the building into a mosque in the 15th century when they took control of Istanbul (then Constantinople), adding minarets, a mihrab (prayer niche) and covering the Christian frescoes and mosaics. These frescoes and mosaics were later uncovered in the 1930s, when Hagia Sophia was converted into a museum. Hagia Sophia’s interior is home to beautiful marble work and carved stone arches, but its huge dome is probably its most memorable feature. Lined with gold mosaic tiles and spanning about 31 metres wide and 56 metres high, it’s said to be the biggest dome in the world.